A Summary Affidavit for the Case History for the Medical Malpractice Structured Settlement Case for the Dosch twins, Travis Keith and Garrett Kirk. 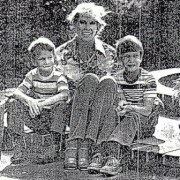 Since December 6, 1978, Edis Ralene (Rain) and her twin sons Travis Keith and Garrett Kirk Dosch began an unending nightmare including both mental and judicial malpractice. This arduous nearly arduous 30-year battle for justice began with a botched delivery of the twins followed by a botched medical malpractice case which was orchestrated for profit by Guardianship and Probate Courts and other agencies thereof. Ralene Dosch’s fourth pregnancy was a nightmare from start to finish–a bad dream whose effects linger today, more than seven years later. First, she said, her doctor did not believe that she had conceived twins–even though her weight soared from 135 to 198 pounds and she delivered more than a month late. And when her two sons were finally born at Martin Luther Hospital in Anaheim, both had cerebral palsy –caused, Dosch believes, by injuries sustained during their traumatic delivery. Travis and Garrett, now 6 1/2, need constant attention, and the financial and emotional stress of caring for two handicapped children has strained the family’s finances nearly to breaking. Relief, however, is in sight for Travis and Garrett Dosch. In 1981, the family filed suit against Martin Luther Hospital and Dr. John Bell, who delivered the children. And on Thursday morning, only moments before their malpractice trial was to begin, the Dosch family agreed to a settlement for the boys–nearly $6.8 million to be paid out over their lifetimes. Although the money will help provide much-needed care and therapy for the blond twins, it may have come too late for Ralene and Bill Dosch. “Our marriage, well, there isn’t one,” said Ralene Dosch, 46. “We’re a physical therapy, medical and legal team. (But) we can’t live together because of the stress and what we have to do for the twins and to make payments and keep it all under control. Travis and Garrett Dosch were conceived in late February, 1978, and the Garden Grove physician Ralene Dosch was consulting told her they would probably be born between Oct. 16 and Oct. 31. An amniocentesis test was done when she was four months pregnant, and it confirmed the doctor’s suspicion that she probably would have twins. But because of the first physician’s language difficulty, Dosch said that she switched to Bell before her delivery. According to Dosch, Bell refused to believe that she was carrying twins and discounted a second heartbeat heard by nurses as merely an echo. The October delivery date came and went, and when Dec. 5 rolled around and the babies still had not been born, Dosch went to Martin Luther Hospital and demanded to deliver. Dosch contended in an interview and in her suit that she had asked Bell to perform a Caesarean section because she feared a difficult birth and because she had open herpes lesions that she did not want her newborn babies to come in contact with. But the doctor insisted on delivering the babies vaginally, she said. Travis was born at 8:09 a.m. on Dec. 6, a breech birth. Dosch was conscious during the birth, she said. Having completed the first delivery, Bell waited for the placenta to drop and ignored nurses’ pleas for him to deliver the second child, Dosch said. But the problems did not end there, Dosch said. When her husband went to see his new babies, he found Garrett having violent seizures in a small room next to the nursery. Several hours passed before the boy was taken to Childrens Hospital of Orange County, where he was kept in intensive care for six weeks. On Dec. 8, Ralene Dosch said, hospital officials tried to discharge her and send her home by taxi, even though she had a urinary tract infection and was hemorrhaging. She was able to wait until her husband came to the hospital and then she and Travis went home. The results of the traumatic delivery have haunted Ralene Dosch. Travis has mild cerebral palsy, according to court documents, and will need physical and speech therapy. He is enrolled in a special education program. His injuries are permanent, court papers said. According to his mother, Travis, nearly 7, still speaks like a 4-year-old. Garrett has more pronounced cerebral palsy, classified as “moderate,” according to court papers. He cannot speak, but only makes guttural sounds. He walks with braces and may never be able to care for himself. In 1981, the Dosch family filed a lawsuit that charges that the infants’ fetal distress was not diagnosed or detected, resulting in prolonged labor and injury to the infants. The suit asked for medical expenses, loss of earnings and damages.